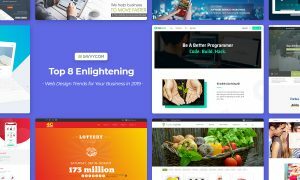 Half of the year 2014 has almost gone, and it’s seems to be a good time for us to examine the fashionable trends of web design in 2014. So, let’s see what they are and how they inspire us during this year. We have witnessed the rise of iOS 7 with the design aesthetic most commonly known as “flat design.” Apple has a lot of big fan, who are likely to imitate what they do. That is one of the primary reasons for the trend of flat design. The other ones may be the reduction of clutter and the increase of blank place bring better user experience. The trick “less is more” will challenge developer, while still inspiring them to create attractive design. In the article discussing about Web design trends of 2013, we did mention Responsive Web Design as the leading trend. This year, Responsive Design remains its top position. As long as users adore mobile devices, business owner will ask for it. And the huge demand would be the great inspiration for designers. Infographics remain the best solution for publishing a bunch of information, which would drive viewers crazy if they were present in the normal ways. Infographics are so eye-catching thanks for the good combination of typography, bold color schemes and shapes in a way that intrigues viewers. Creative developers always try to bring a story atmosphere around their facts and numbers, for example, a potential future of e-commerce site, or the terrible fact about smoking in the local area. Infographics facilitates information transfer between designer and viewers. Therefore, it will definitely be used more and more in 2014. Videos are even more interactive than typography – though it’s not a good idea to give a comparison here. Since videos are becoming more and more easier to make, to convey messages and to share to social networks, they achieve an important position in the list of design trends in 2014. Videos are even more trendy in technology field, because it provide a more effective way to communicate rather than texts or photos.